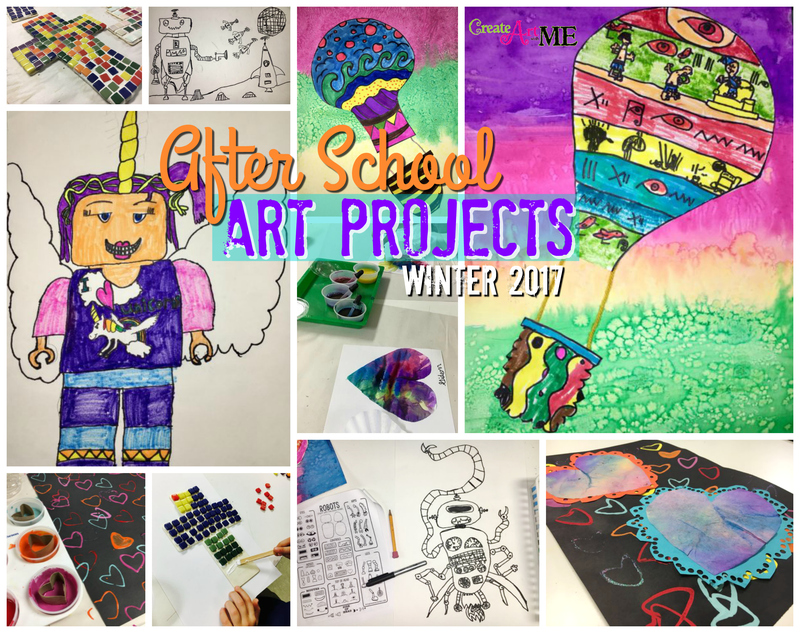 This winter/spring session of after school art included students from K-4th grades. Below are the projects we created. Inspired by Housing a Forest-Heart Tube Stamping for the background. The hearts on top were made from liquid watercolors and coffee filters I had pre-cut into heart shapes. Watching the hand made liquid watercolors spread on the coffee filters was SO much fun! We used liquid watercolors that we made from dead markers that had gone to “marker heaven”. We also put construction paper behind the coffee filters (after dry) and punched holes to look more like doilies. Inspired by Deep Space Sparkle-Where the Wild Things Are Watercolor Lesson and Expressive Monkey’s How to Draw Monsters (I LOVE LOVE LOVE these Roll & Draw Handouts!-NOT an affiliate link). We designed our own unique monsters by incorporating at least 3 different animal body features from 3 different types of animals (like fins, wings and horns) into a NEW creature. I have also done this as a SCULPTURE lesson-Roll a Beast Animal Sculptures with my high school students and they LOVED it! Sorry-I sent all the drawings home before taking any pictures-AHHH! 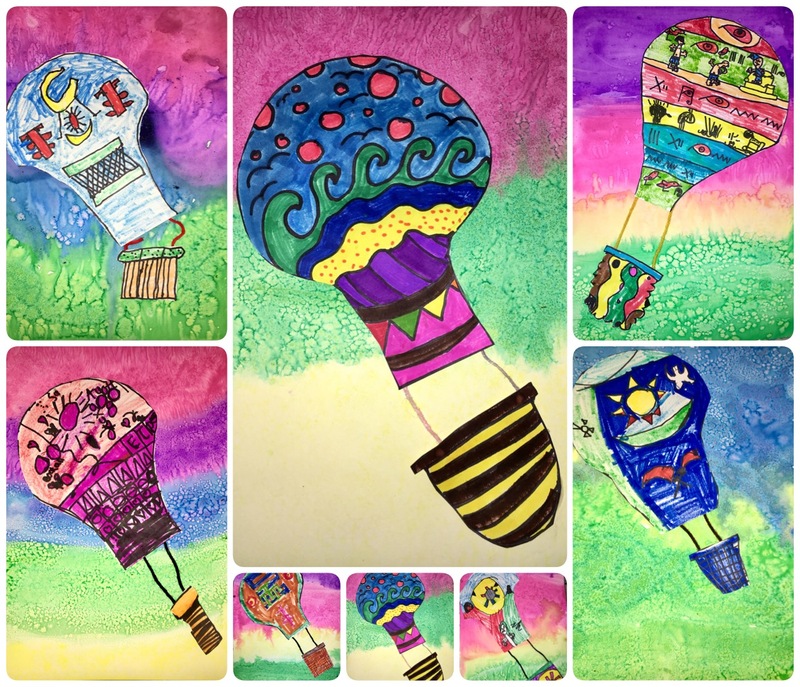 Drew hot air balloons & basket on a separate sheet of paper and colored with markers. Yarn was added to attached balloon to the basket. Painted background with liquid watercolors and salt, then glued them together. Inspired by The Art Teachers Closet – In the Art Room – Lego Designs. My students drew their own bodies-I wanted them to learn to draw the mini-figures. Then they drew either their own original design or replicated a mini-figured they liked. Inspired by Expressive Monkey’s How to Draw Robots & Rockets (Again-I LOVE these Roll & Draw Handouts!-NOT an affiliate link). This post was written by Michelle C. East (All rights reserved). If you choose to use any of this lesson (written or photos), please link back to this blog Create Art with ME!